← JERRY ROBERTS. The Cuckoo and the Nest. MELISSA SWEET. Please support this crowdfunding campaign, so we can cover the 4th Peoples’ Health Assembly – #PHA4. 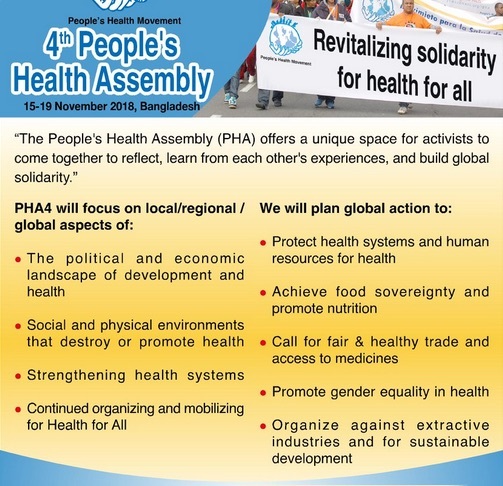 Please consider supporting this crowdfunding campaign to enable Dr Lesley Russell to report for Croakey from a landmark global health meeting in Bangladesh from November 15-19 – the 4th Peoples’ Health Assembly – or #PHA4. It would be a terrific opportunity to bring our readers news and analysis about global developments in the 40 years since the famous Alma Ata declaration on the importance of primary healthcare. Professor Fran Baum, a public health researcher from Flinders University in South Australia, who attended the first Peoples’ Health Assembly in Bangladesh in 2000, describes it as a transformative experience that had a profound impact upon her work and life. Baum would like to see many others benefit from the knowledge, stories and passion shared at the Peoples’ Health Assembly, and says it is important to share the news from this conference more widely. This would enable health advocates around the world to see that many of the problems they face – the privatisation of services, the power of transnational corporations, and the impacts of unhealthy food systems, urban development and extractive industries – are global in nature. Russell, a contributing editor at Croakey and author of The Health Wrap, is also keen to cover public health issues such as the impact of climate change and associated natural disasters and infectious diseases increasingly resistant to antibiotics. Read about the objectives of the Assembly here. This article was published by Croakey on the 19th of September 2018. Melissa is the founder of Croakey.